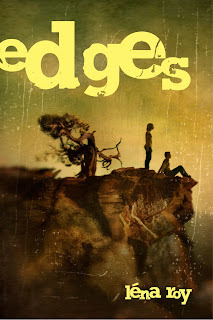 Léna Roy: Win a Copy of Edges! 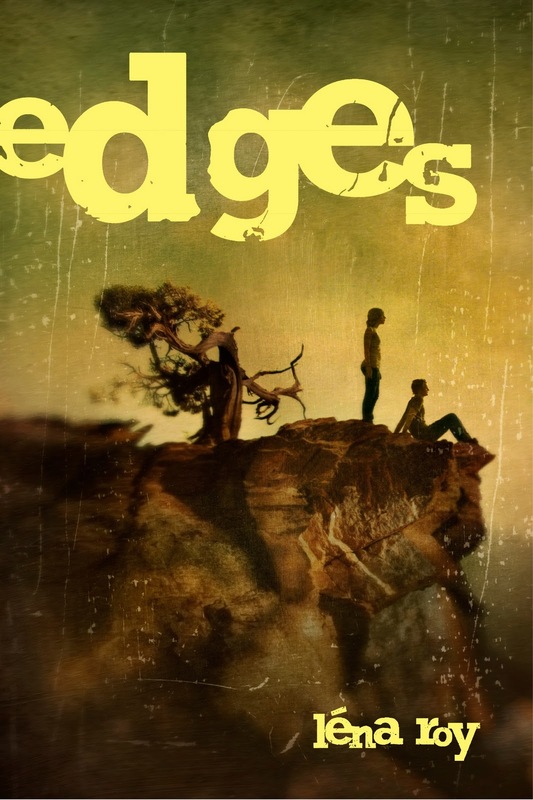 Win a Copy of Edges! I am feeling a bit blue because I've had to reschedule my trip to the wonderful independent bookstore, RJ Julia in Madison, CT tonight. I just can't seem to shake this cold . . . The door finally gave way and instead of opening, fell forward . . . I will pick a winner at random on Saturday evening, and you will receive . . . a personalized autographed copy of Edges, and an extra small surprise - I don't know what that is yet, but I'll think of something . . .
PS If the prompt doesn't float your boat, then tell me about a time when you made (figurative) lemonade out of lemons! i am just back from yoga class and yoga is actually lemonade for me- in college and a few years after i was really into running- it was my place to relax, rebalance and clear my head and i treasured my runs. but in my mid-twenties my knees said they were through with the running thing and i was just bereft. but then i found yoga which i love even more than running, something i never would have believed. so that is my lemonade! The door finally gave way and instead of opening, fell foward. I expected a crash as the oak door impacted the tile floor but instead the smooth ecru sheen began to stretch under the weight of the slab like a malfunctioning parachute. Within seconds, the entryway table clattered on top the sinking door, its glass top shattering while I flinched. The floor continued to give way, toppling all furniture within my eyesight. It was then I felt the porch begin to sag under my own weight. The door finally gave way and instead of opening, fell forward . . . I stumbled my way out of the entryway and snagged my shin on the rough edges of the old plank of wood that was once the door to my cabin. In front of me stretched a large field of golden barley bending gently in the slight breeze. I immediately sensed the numinous quality of the light. It played tricks with my mind; object were one minute outlined in violet, then orange, then all was normal. My head began to ache as my eyes tried to keep track of the flickers and my mind began to sense the wicked bruise growing on my leg. "I should be scared. This is not normal," a corner of my mind blinked at me. I was not afraid, only curious. I had the feeling that something big was about to happen. Just as I knew if I turned back to the house, with its door lying haphazardly on the ground, it would not be there. The door finally gave way and instead of opening fell forward with a loud bang that seemed to reverberate throughout the sanctuary. I waited until my heart slowed while my eyes adjusted to the blackness. It was a Friday night, I told myself. No one came to the church on Friday nights. If a tree falls in a forest, does it make any sound? If a door bangs in an empty sanctuary, does anyone hear it? God, I suppose. I smiled at my lame attempt at humoring myself. Irony in the place of fear seems to be a specialty of mine. I carefully propped the door against the threshold, leaving a small opening so that the light of the hallway could guide me back. I waited again. After a few moments, I could make out the network of pipes that ran behind the organ. The dim light from the open door behind me illuminated the outlines of hollow wooden rectangles in varying sizes. I ran my hands over the grain of one and then another, imagining the craftsman who deliberately carved each piece, knowing the exact dimensions that would produce certain sounds. Did he know that this piece of wood was one of a number of other pieces of wood that would produce a powerful Bach fugue? Did he ever hear his craftsmanship played out in the terrible awe-inspiring force that accompanied every Sunday entrance and exit from church? Every wedding? Every funeral? I kept walking, moving among the pipes until I reached a narrow staircase that winded up to what appeared to be a kind of listening booth. The door had been left open this time. And when I entered, I saw a soundboard with various knobs and lights that seemed to direct the sound and lighting in the sanctuary. It was here, I realized, that organist, pastor, and electrical technician orchestrated our church services. One button read “Organist,” another read “Pulpit 1,” another read “Pulpit 2;” there were dimmers and volume gauges and beside them, a notebook which seemed to be a playbook, of sorts, for the technician to manipulate the service with more sound, less light, or even entire darkness, as in the case of the Christmas Eve service, dated three days ago and marked in pencil scrawl with an “All Black except for Star”—referring to the large star that hung in the nave of the sanctuary during the Christmas weeks, I presumed. I half-smiled, chucking through my nose, as I read through the notebook in my hands. I imagined the man who sat in the chair in which I was sitting, and I thought of Dorothy discovering the man behind the curtain who controlled Oz. I thought of the steadfast parishioners who came to this church every Sunday. I thought of my own mother, who was one of them, crying every time she felt the organ shake up through her feet into her bones. I thought of craftsmanship and faith, truth, and what we want to be true. And just then, the organ started. I ran down the staircase, making for the fallen door, and stopped amid the maze of pipes, feeling the pulsing vibrations of sound coarse through my own body. I thought of God again. If you’re alone in an empty sanctuary, is it possible to see, hear, or feel God? And then I remembered. I wasn’t alone. I'm currently in a graduate program working on my master's in communication disorders. My husband is also in school working on his bachelor's in communications. However, our schools are about 35 miles apart, so 4 days a week I commute to school in city traffic. Most days traffic and driving are lemons, however I found a little local radio station that I listen to everyday to help the commute go by faster, and through this radio station won tickets to see one of my all time favorite bands. Also, when I'm particularly dreading the drive, I remember me at 18 years old leaving for college and how incredibly nervous I was and how 5 years later I'm tackling inner city traffic attending the top school in the state, spreading my wings farther than I would have thought possible then. I also know I am incredibly blessed to be able to attend my choice school and pursue my dreams and education. So that's my lemonade! You guys are all so incredibly awesome for playing with me! And I LOVE all of your writings - I want MORE! You all win in my book, but I have only one copy to give away - hopefully I'll meet you all someday in person and we can trade autographs! So here's how it went down: hubby and I just finished watching the latest Robin Hood with Russell Crowe. (LOVED it!) I wrote down your monikers and assigned you numbers, 1-5. Then, hubby rolled the die and it was #4. You know who #4 was? onegirlarmy35!!!! I will email you tomorrow and get your address in order to mail on Monday!!!! !